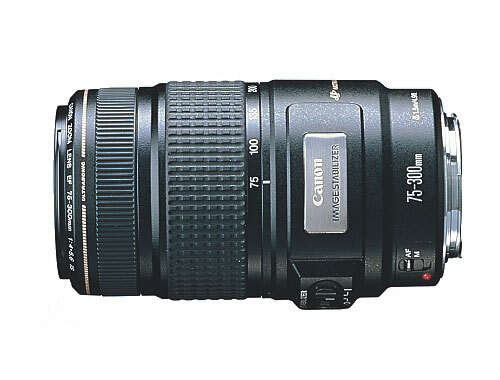 Canon EF 75-300mm f/4-5.6 IS USM was Canon’s first lens with IS (image stabilizer). It has already been discontinued and replaced by the EF 70-300mm f/4-5.6 IS USM since October 2005. The build quality of this lens is acceptable, in line with other consumer lenses made by Canon. It uses a micro-USM rather than ring USM focus motor, so it does not support full time manual focusing (FTM). The front of the lens rotates during focusing, so it isn’t really polarizer friendly. The first generation Canon IS is effective, but not as effective as the newer generations IS lenses. It can compensate for up to 2 stops rather than 3 stops in newer generations of IS. Focusing is slowish as well, accuracy is fine though. So combined with a smallish maximum aperture, this lens isn’t really suitable for fast action and sports. The image quality is fine between 70-200m, but turns rather soft beyond 200mm. Although, depending on the subject you are shooting with with some sharpening during post-processing, it may be possible to get acceptable results. Your mileage may varies though. The advantage of this lens now is that it has already been discontinued, so you can probably find it for quite cheap on the 2nd hand market. It maybe a fair choice if your budget is limited. The following are some sample shots I have made with this lens. how much is this lens on hongkong streets? This lens has been discontinued for awhile. I doubt if you can get a new one anymore. I am afraid I have no idea what the 2nd hand price is. what do you mean by discontinued? so i can’t find a new one in hongkong? how bout price of 18-250mm IS and non IS? and 18-200mm IS and non IS ? I don’t think I need to explain to you what I meant by “discontinued”. I think I quite clearly and explicitly told you already in my last reply and in the main text above. What 18-250mm and 18-200mm lenses were you talking about? Canon only makes one version EF-S 18-200mm IS, other lens makers like Tamron and Sigma makes various versions of 18-200mm, 18-250mm and 18-270mm lenses with or without image stablizer. is it correct that in hongkong only 2100? Official manufacturer recommended retail price in US is not representative of street prices in Hong Kong (actually, it’s not even representative of street prices in US). That’s all I can say. If they are the same, then there would be no need for me to publish a Hong Kong street price list. Depending what camera you are going to use the Sigma lens on, the general rule is that you need shutter speed 1/focal length(for 35mm full frame) to able to avoid blurring due to hand shaking. So on a full frame camera, you will need to use shutter speed of 1/300 seconds or faster for 300mm focal length. On a cropped frame APS-C sensor camera, then you will need shutter speed roughly 1/500 seconds or faster.